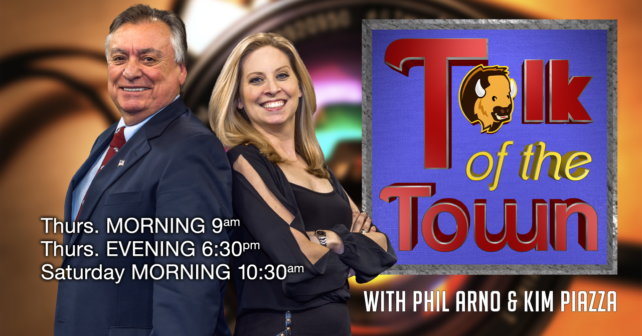 Phil Arno and Kim Piazza co-host “Talk of The Town,” a new magazine / talk show on WBBZ-TV. The show airs Thursday at 9a.m. & 6:30p.m. and Saturday at 10:30a.m. on Your Hometown Television Station. Phil Arno, the owner of WBBZ-TV, launched “Political Buzz” on the station in 2012. “Talk of The Town” replaces that while offering a broader spectrum of topics, which will continue to include politics, as well as lifestyle, celebrity interviews, and issues of interest for WNY. LIKE WBBZ-TV on Facebook and share your comments. Phil Arno had a long career in television news from Buffalo to Los Angeles, earning him several Emmy Awards for videography from the 1970’s through 2000. An accident while shooting from a helicopter at the 2000 Academy Awards nearly claimed his life. He came back to Buffalo soon after with his wife Mary and their three children, settling in Clarence before purchasing the station in 2010. Kim Piazza has been a part of our hometown entertainment scene for 20 years. Kim has multiple credits with the Alleyway Theatre, and served as Artistic Director for the women’s theatre company Theatre Plus. Kim has made film appearances in “Dry Bones” and as solo vocalist in “The Ghost of Old Fort Niagara.” Kim is also the host of WBBZ-TV’s infotainment program, “What’s The Buzz in WNY!” Kim, husband Armand, and their family live in Clarence. WBBZ is seen throughout Western New York over-the-air on digital channel 67.1. Ch. 5 on Verizon FiOS (HD 505); Ch 5 Dish; Ch. 67 DirecTV, and these Time Warner Cable channels: Buffalo – Niagara Falls Metro area: Channel 5 (HD 1230); Batavia – Genesee, Wyoming, Orleans Counties Channel 71 (HD 1230); Parts of Erie and Niagara Counties Channel 71 (HD 1230); Dunkirk Channel 99 (HD 1230); Olean Channel 21 (HD 1230); Fredonia – Jamestown Channel 72 (HD 1230); Alfred- Angelica- Avoca- Bath- Bolivar Friendship- Hornell Channel 71 (HD 1230).